Are you tired of your control arms always coming out of adjustment? Stop the constant axle misalignment with TeraFlex JK/JKU Flexarm Cam Bolt Washer Kit. 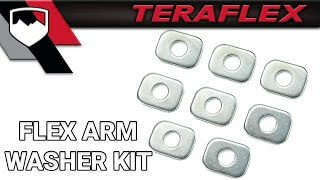 These TeraFlex JK/JKU Flexarm Cam Bolt Washers lock the cam bolt into position to eliminate potential movement, which causes axle misalignment. Fits into the factory locations of the front lower and rear upper cam bolt adjusters.